Many thanks to Pauline Boughton who recently sent me a transcript and photo of this rental document she came across in the Buckinghamshire Archives in Aylesbury. She’s not yet worked out if it relates to ‘her’ Thomas Bowden – who died ten years later at Dropshort (roughly halfway between Tingewick and Buckingham), leaving a will which I will also post here in due course. It has long been an ambition of mine to research my family history. My mother, whose maiden name was Jones, is still very much alive. So, I decided to start with her. Now the name Jones is a bit of a challenge for a novice genealogist, so I was much more optimistic about my maternal Grandmother who was born a Branigan. That will be easier, I thought. I had no idea how complicated it would become. I first found my Great Grandfather, Thomas Francis Branigan on the 1881 census, living in Aston, Birmingham with his mother, Mary Ann (widowed), his brothers and a lodger. Aston was an extremely industrial part of Birmingham, the city of a thousand trades. Many of these trades were in Aston. An old map reveals brass foundries, gun makers, drysalters, sharing space with hundreds of houses. It must have been a noisy, polluted place. People were poor, housing overcrowded, sanitation appalling and children played barefoot on the streets. Now Mary Ann Branigan seemed like an unusual name to me. I thought that I was well on my way. I also saw that Mary Ann was born in Tingewick, a village I didn’t know but one that was to become very important to me in my research. My next find was Mary’s marriage in London to Robert Walter Branigan, an apothecary in London. She was 20. He was 38. How exciting was that – a 19th century apothecary. The marriage certificate gave me Mary’s father as John Sheppard. This is going to be easy, I decided. I was so excited about this woman from Tingewick who married in London and was living widowed in Birmingham. What had happened to her? Well, quite a lot really. Now the rather great thing about Tingewick is that there is a fantastic website. It didn’t take me long to do a search. I wanted to know where it was and what it was like. I didn’t anticipate finding that somebody wonderful had researched families from the village. I was able to see that my great, great grandmother, Mary Ann Branigan, then Sheppard was baptised in Tingewick in 1842. Her mother Mary Ann(2) Sheppard (nee Everett) was born in 1820 and her mother Catherine Packer was daughter and granddaughter to the John Packers who were watch and clock makers. It was thrilling to be able to go right back to the middle of the 18th century with very little effort on my part. I noted that there was a facility to contact Su (su@tingewick.org.uk) which I did. I had no idea where it would lead me. In fact, it took me right back to Mary Ann Branigan who was to prove a fascinating character. Su responded very quickly with a rather strange marriage certificate (above). The certificate is not signed and there is an objection on the bottom saying that Mary Ann is the daughter of the sister of Robert Walter Branigan’s late wife. But Robert then appears before the magistrate and declares that he has never been married. So, two days later on 18th July 1862, Mary Ann and Robert Walter (who now claims he is a bachelor and not a widower) are married. There are at least three issues with all of this. In 1851 my great, great grandmother, aged 8, is living with brother and their mother – also Mary Ann(2) Sheppard and apparently still married – in their grandparents’ house in Hackney. Less than three weeks later Mary Ann(2) married Robert Walter Branigan. Yes – the same man. Mary Ann(2) died in 1856. So, Robert Walter Branigan’s late wife was my great, great grandmother’s mother and not her aunt! There is definitely a marriage certificate so he was married. In addition, Mary Ann says that her father is John Sheppard which I, as a novice, had taken as gospel until Su put me straight. In fact, her father was Edward Sheppard. I have to assume that the couple lied in order to convince the authorities that Robert’s late wife was an aunt and not her mother. Su, whose help and guidance have been invaluable in my research, has not yet been able to find a death record for Edward Sheppard so it is possible that Robert’s marriage to Mary Ann’s mother was bigamous, and hence invalid, so he might have been a bachelor but why all the initial lies? Naïve as I am, I had assumed that Robert Walter was my great grandfather’s father but again Su helped me out. They did have children, Elizabeth, Richard and Robert but only Richard survived. In 1873, Robert Walter Branigan dies. Mary Ann is only 31. My great grandfather was born in 1876 and on his marriage certificate to my great grandmother, Eliza, he says that he was born in Southampton and that his father, also Thomas Francis, was a captain. Now, I have to admit that I thought this was a bit farfetched. I did find a Thomas Francis Branigan, a retired army officer, living in Southampton, on the 1871 census but, he was born in 1810 or 1814, depending on what you believe and he was already married to 62 year old Mary Ann(3) Branigan. Could he have been Robert Walter’s older brother? Having married her stepfather, had Mary Ann now had a child with her much older, step uncle? Again, Su slotted another piece into the jigsaw puzzle. She found Thomas Francis’s (elder) earlier marriage. His father, like Robert Walter’s, who was born in Tipperary, Ireland, was a Richard Branigan. This suggests that they might indeed have been brothers and Mary Ann might have gone to seek help following the death of her husband. Even more fascinating, Thomas Francis’s (elder) first marriage to Mary Ann(3) Michell took place in Agra, Bengal, India where he was a soldier, initially for the East India Company. Mary Ann(3) died in December 1875 and, Su found that in March 1876 Thomas Francis (elder) Branigan married Mary Ann. Less than 6 months later, Thomas Francis Branigan, my great grandfather is born. I tend to feel that Thomas Francis (elder) is the biological father and that the marriage was rushed for obvious reasons. In September 1877, less than one year later, Thomas Francis (elder) dies leaving effects under £300 to Mary Ann. This probably equates to somewhere between £16,000 and £24,000 today. Yet, four years later Mary Ann is in Birmingham with a lodger. She goes on to have at least two more sons. In 1891, she is working as a seamstress and has her four younger boys living with her. In 1901, Mary Ann is admitted to Aston Union Workhouse. She is 58. Two months later she is dead. The girl from Tingewick lived a colourful life, one marked by death and loss. I have still so much to find out. Why did Mary Ann move to Birmingham? Why did she end up in the workhouse? What was life like for Thomas Francis in India? Can I find out anything about my Irish ancestors? Genealogy is better than any whodunnit on television. These were real people whose genes I, my children and my grandchildren share. I am hooked and so grateful for the Tingewick connection. My thanks to Su (su@tingewick.org.uk) without whose help I would not have got nearly as far and I might have gone down the wrong path altogether. I was so glad of her experience and the time she spent on my behalf. BUCKINGHAM PETTY SESSIONS, October 30. SELLING BEER WITHOUT A LICENCE. — James Moody, alias, James Townsend, alias Wiltshire Jemmy, late of Tingewick, was charged by Mr. Thomas Jones, Excise Officer, with having sold beer at Tingewick without a licence. The accused did not appear, and it was stated that he had absconded. The charge was that he had sold beer at a building by the side of the Buckinghamshire Railway works. Mr. A. Cornwall, Supervisor of Excise, appeared on the part of the Crown. It appeared that the summons had been left at Jemmy’s late habitation but nine clear days, whereas ten clear days were required by law. The Magistrates in consequence declined going on with the case. Mr. Cornwall forthwith applied for, and obtained, a fresh summons. POOR RATES. — William Steeden, wheelwright, summoned by Mr. A. Durrant, one of the overseers of Tingewick, for arrears of poor’s rates, amounting to 7s. 10½. Thomas Hayward, working brewer, was also summoned for 5s. 3d. The parties pleaded inability, and stated their circumstances to the Magistrates, who said they had not the power of excusing them, and that as the rates were pressed they must order payment; but they considered that the parish ought not to enforce the rates, and they advised the defendants to apply at the next vestry to be excused from payment. — Mr. Thomas Painter said that the men were tenants of his; they had been picked out, while others living in better cottages, and who were more able to pay, were excused, and that persons who had 100l. in the bank were not made to pay. — Mr Durrant said the men were able to pay, and that Mr. Painter, the guardian of the parish, ought not to tell persons not to pay their rates. — The defendants were ordered to pay the rates, and 2s. each costs. As some of you know, I’ve been unable to update the Index of Names since the end of 2007. The program I wrote to create the pages pre-dated Windows, and I now use an iMac. I struggled to find a genealogy program that suited me, and have finally settled on iFamily for Mac. It includes a good, adaptable page generator BUT will only produce them for one ‘family’. I eventually hit on the notion of creating a single super-ancestor (called, not surprisingly perhaps) Tingewick. I have finally finished connecting all 18,000 people in my database to this one imaginary person and have uploaded the results here. Of course, I am now finding a host of discrepancies which will take me another half-lifetime to fix: meanwhile I haven’t added the 1911 census returns … and so it goes on. Hopefully, though, the extra (and updated!) information on the new pages will make up for the rather clumsy index and linkage back to the main Tingewick site. As always, if you see any errors/omissions, please do let me know so I can correct. Meanwhile – enjoy! It may sound odd to say I’m pleased when someone points out a mistake in the Tingewick database: but I am. If nobody tells me, then I may never spot the error and – given the way of t’Internet – it may continue to burrow into other folk’s trees for ever. I had two sent to me this week! The first pointed out that Catherine Read bp 1838 did not die in 1865. That burial was actually for Caroline Read née Holton, wife of Andrew, and had in fact also been attached to her record. Catherine, too, was duplicated in the database – I had recorded her in 1881 in Skelton, Lancashire with with her husband Robert Withington and their children, but had failed to make the connection with her baptism and earlier census returns in Tingewick. Thanks to Anna, I’ve now found the other intervening census returns, Catherine’s mother’s marriage to Anthony Druce, and tidied up an assortment of loose ends. The error in this case was that the first Thomas did appear on the database … but his age in 1851 looked very much like 29 not 39 and so had been mis-transcribed on the Buckinghamshire Family History Society 1851 census returns database. Later returns show quite clearly that this is wrong. So – are the two actually the same person? I’m undecided. On the one hand, the ages don’t quite tally. On the other, if they aren’t the same, then whose child is the first Thomas? In 1832, John Cross – a mason from Tingewick – and his wife Frances née Terry arrived in Tasmania aboard the ship ‘Forth‘. He seems to have led a most interesting life and I’m hoping one of his more knowledgeable descendants might write about him here in due course. John and Frances’ second surviving daughter Eliza was barely fifteen and already pregnant when she married convict Isaac Coote, to whom she bore at least five children before dying of ‘paralysis’ in 1868, aged just 45.
Who, though, was Isaac Coote? My search led me to discover the wealth of information available through the Tasmanian Archives Online website and its Tasmanian Names Index – a vast number of searchable scans, freely available. A word of warning, though – the images are HUGE and very slow to load, so not something to attempt on a mobile phone signal! Isaac was, it seems, convicted of housebreaking at Bury St. Edmonds Assizes on 15th March 1832, one of thirteen men sentenced to death for offences ranging from sheep-stealing to sacrilege. As often happened at the time, none of the sentences were carried out: most were commuted to transportation – one for 7 years, the others (including Isaac) for ‘life’ but one man (a sheep-stealer) was merely imprisoned for 12 months! Six months later, Isaac was one of 200 convicts aboard the ‘York‘ sailing from London and Plymouth, arriving in Hobart on 29th December 1832 after a three month voyage. On arrival, his description was carefully noted: he was 5’5½”, aged 19, with fair complexion and a small head. His hair was brown and he had ‘small’ brown whiskers. His ‘visage’ was small and narrow, his forehead low and retreating. His eyebrows were dark brown, his eyes dark grey, his nose small and his mouth ‘normal width’. His chin – in proportion with the rest of his face – was ‘small’ and he had a blue mark on his left arm. Once disembarked, he was assigned the number 1442 and assigned to work for a Mr Fletcher as a ‘house servant’. According to his conduct record, he had a few brushes with authority – absconding, ‘neglect of work’, and helping himself to his master’s ‘porter’ and chickens. However, in February 1838 he was granted permission to marry Eliza Cross; in June their daughter Matilda was born followed by Emily (1840), Clara (1842) and Alfred Richard (1847) – Isaac’s occupation recorded as a ‘tailor’ on each of the birth / baptism records. 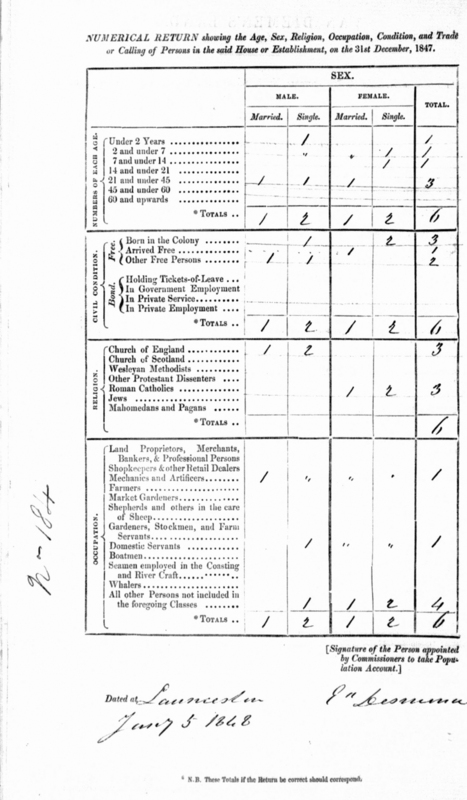 The 1848 census return gives a full and interesting view of their household. The house was brick-built, in parish ‘No 2’ There were three adults (aged 21-45) living there, presumably Isaac and Eliza and another unmarried male. Both men seem to have been freed former convicts. Although Isaac and Eliza had four children by the last day of 1847, only three were recorded as living at home at the time of the census. All are said to have married and had children: who and where was the missing child? Matilda was by this time 10 years old, soon to be 11. Was she, perhaps, already working in another house in the town? No names are given in the census, so we may never know. Rather surprisingly, both men and the baby are said to be Church of England, but Eliza and the two girls were Roman Catholics! Isaac’s occupation falls under the heading of ‘Mechanics and Artificers’: the other man was a ‘Domestic Servant‘. 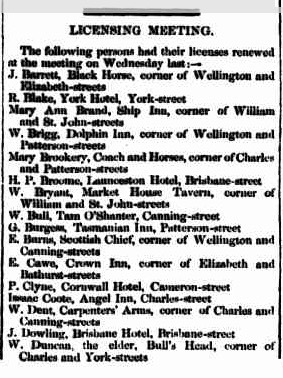 In 1850, Isaac took up a new career – licensee of the Angel Inn in Charles Street Launceston – a licence he renewed three times, the third time in October 1853. This new occupation is reflected in the baptism record of their daughter Adelaide Frances in 1851. In May 1854, Isaac took on the licence of another hostelry – this time the Jolly Farmer in the township of Perth on the plains to the south of Launceston. 18 months later, there is a rather odd birth recorded at Longford (close to Perth and around 7 km / 4.5 miles to the West): Arthur Isaac Coote, son of **Sarah** and Isaac Coote: father’s trade is given as “Licensed Publican” so it seems reasonable to assume this is ‘our’ Isaac. It’s been suggested that Sarah might have been Sarah Cross – Eliza’s sister – but I’m unconvinced. She was married to James Devall, had borne him a daughter in the previous year or so and would bear him another two years later. My best guess is that the wife’s name has been mis-heard, mis-written – or even mis-remembered by the registrar. The page does not seem well-maintained – several entries (including this one) are lacking the informant’s signature, and the mother’s maiden name is also omitted. By 1862, they were back in Launceston, this time running the Hadspen Inn, renewing the licence each year until at least 1865. In 1868, Eliza Coote died of “paralysis”, aged 45, and two days before her 30th wedding anniversary. 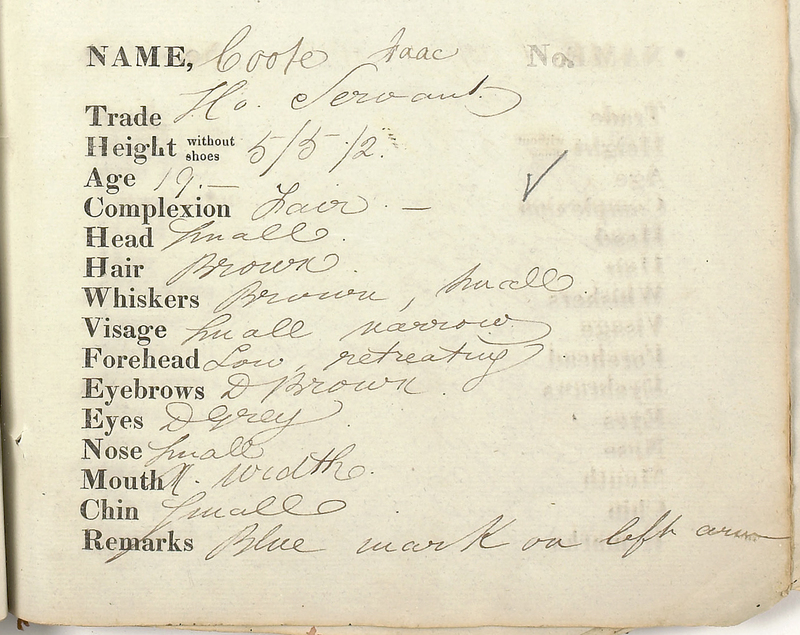 Her occupation is given as “Publican’s wife” and Isaac registered the death. Hardly the actions of an estranged husband who was living with another woman, since they had grown-up children who could have done what was necessary. Fourteen months later, Isaac married again – this time to the 24 year old Adeline Laird. The marriage took place in his house in Youngtown. 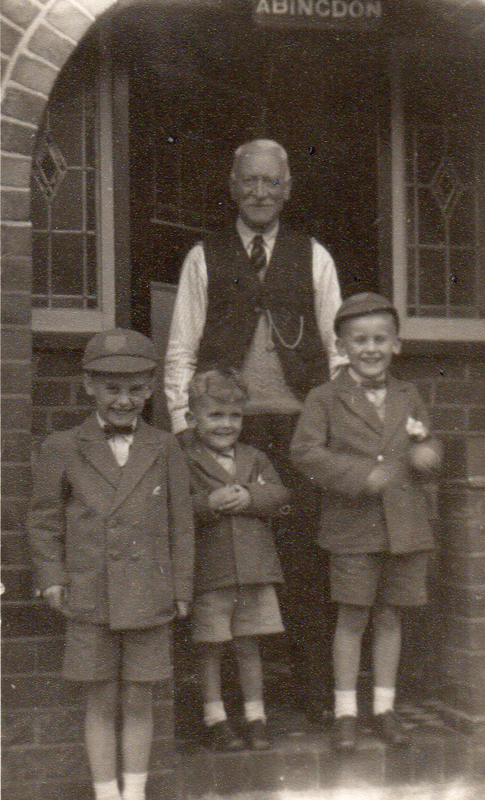 Their son Thomas James was born the following year, 1870: Isaac was still recorded as a ‘Licensed Victualler’. Isaac died at Launceston on Christmas Day 1873 of ‘Dropsy’, aged 58 – having apparently reverted to his original occupation of ‘tailor’. What, though, of Isaac’s origins? My money is on Isaac Coot, born (according to Ancestry) 29th November 1814, at Sudbury in Suffolk, son of Isaac Coot and Matilda. There are other births recorded for the couple: Robert (15 Oct 1812), Richard (8 Mar 1817) and Eliza (17 May 1819) but I’ve not found their marriage. On 29 Jan 1761, at All Saints, Sudbury, an (earlier) Isaac Coot married Sarah Pain. On 10 Oct 1734, at All Saints, Sudbury, an (earlier) Isaac Coot married Elizabeth Sneell.